Ringstar Boxing will hold “Ridhwan Ambunda II-The Rematch” on March 29, 2019 at the Singapore Indoor Stadium in Kallang, Singapore. On the card are five Filipino boxers led by International Boxing Organization World Bantamweight Champion Michael “Gloves on Fire” Dasmarinas, 26, of Pili, Camarines Sur, Philippines. “Ridhwan Ambunda II-The Rematch” marks the fourth Ringstar Boxing bout of Dasmarinas, who holds a professional boxing record of 28 wins, 2 losses and 1 draw. In the main event, Muhamad “The Chosen Wan” Ridhwan, 31, of Singapore will have his rematch with Paulus “The Rock” Ambunda, 38, of Namibia for the vacant Boxing Council Silver Featherweight title. In the co-main event, Dasmarinas will face Kenny “Big Heart” Demecillo, 26, of Cebu City, Cebu, Philippines for an International Boxing Federation world title eliminator fight. The latter has 14 wins, 4 losses and 2 draws. 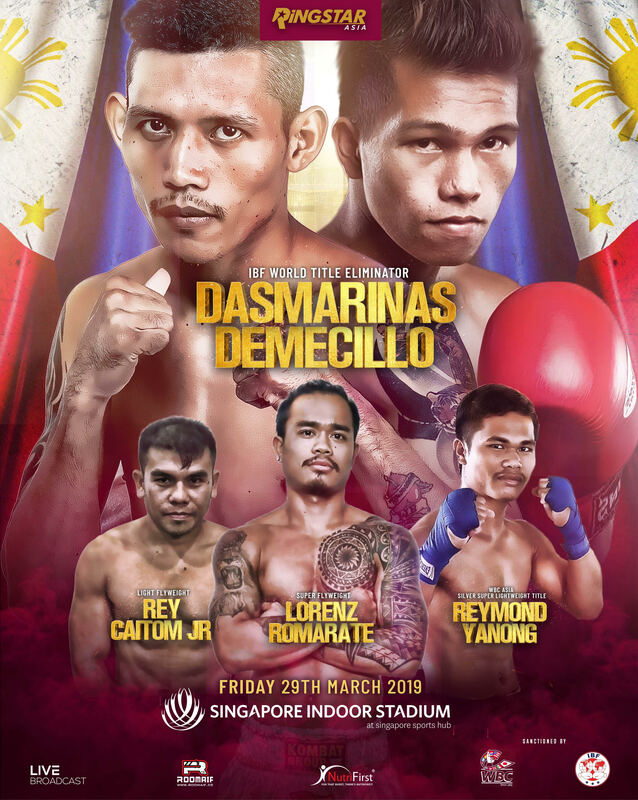 Having earned the IBO World Bantamweight title on April 20, 2018 in Singapore, Dasmarinas has been grabbing headlines in recent months. When he was 9 years old, a relative burned his gloves in an attempt to dissuade him from boxing but now, he has come a long way. On the other hand, Demecillo held the World Boxing Federation Intercontinental Bantamweight Championship belt one. He is also a former two-time WBF Asia Pacific Bantamweight Champion. Joining Dasmarinas and Demecillo at “Ridhwan Ambunda II-The Rematch” are Reymond Yanong, 25, Rey “The Future” Caitom, 32, and Lorenz Michael “Magic Mike” Romarante, 26. Like Demecillo, Romarante is also from Cebu City while Caitom is from Mandaue City, Cebu and Yanong is from Escalante City, Negros Occidental, Philippines. Yanong, who has 9 wins, 4 losses and 1 draw, will face Cairo “The Waikato Warrior” George, 28, of Hamilton, New Zealand for the WBC Asia Silver Super Lightweight title. The latter has 16 wins and 1 loss. Caitom has 7 wins, 0 loss and 1 draw. He will competed in the light flyweight division against Hans Raj Takur, 23, of Shimla, India, who has 3 wins and 1 loss. Romarante has 11 wins, 1 loss and 1 draw. He will face Yuya “The Problem” Nakamura, 28, of Tsue, Mie, Japan, who has 9 wins, 2 losses and 1 draw, for the super flyweight division. Tickets, which range from $38-$118 and go on sale February 1, 2019 on Sports Hub. A VIP ringside sofa seat, which is at $1,888, comes with uninterrupted views of the ring and a personalized butler service with free flow drinks. Early bird discounts of 30 percent off all tickets until February 28, 2019 with promo code “Ringstar.” All fights will be broadcast live globally with more details to be announced soon.